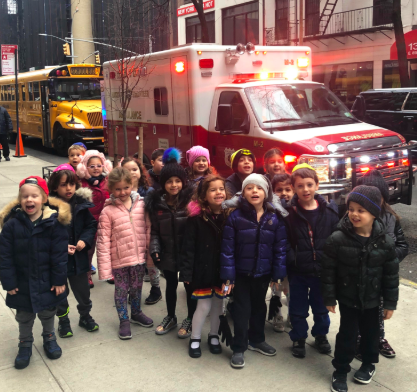 Pre-K Tzahov Children View A Real Hatzolah Ambulance! In conjunction with learning about transportation, Pre-K Tzahov had the privilege of seeing a real Hatzolah ambulance! Mr. Leo Esses (Elias' father) gave the class a tour of the ambulance. Students learned about the blood pressure machine, checked out the walkie talkies, tried on helmets, saw the stretcher, and were fascinated by the Band Aids -- the most used material on the ambulance. In order to prepare for the visit, the class made predictions about what they might see and asked thoughtful and insightful questions once on the ambulance. Students were excited to learn more about this wonderful and live-saving mode of transportation!